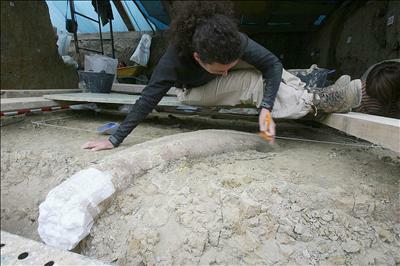 Mammuthus meridionalis, otherwise known as the Southern Mammoth, was double the size of today’s elephants: it weighed up to 12 tons and could reach a height of 4.5 metres. Meanwhile carbon 14 dating has been used by Barcelona University to date the death of some animals recently found in the Cova del Paralló cave in Valencia. The location was first used 27,000 years ago by the first Sapiens Sapeins, and the latest carbon dating of foodstuffs ingested by the animals puts the date at 12,410 years ago. Excavations at the cave began 78 years ago and now the site is considered to be one of the most important in Europe.